Опубликовано 08.02.2019 пользователем July N.
On the evening of July 14,1952, a Pan American World Airways DC-4 was on a routine flight, ferrying from New York to Miami with ten passengers and a crew of three, including, Captain F. V. Koepke, First Officer William B. Nash and Second Officer William H. Fortenberry. The sun had set an hour before though the coastline was still visible, and the night was clear and almost entirely dark. With the aircraft set on automatic pilot, while cruising at 8000 feet over the Chesapeake Bay approaching Norfolk, Virginia, they were due to over fly the VRF radio range station in six minutes and make a position report. In the mean time, since this was Fortenberry’s first run on this course, Nash, in the left pilot’s seat, was orientating Fortenberry by pointing out landmarks and the distant lights of the cities along the route. The time was 8:12 Eastern Standard Time. As the reality of their experience dawned on them the first question which came to mind was whether anybody else onboard had seen the spectacle. Fortenberry went through the small forward passenger compartment, where the captain was intent on paper work. In the main cabin a cautious inquiry whether anyone had seen anything unusual produced no results. Back in the cockpit, the pilots radioed Norfolk and gave their position according to schedule, and upon receiving confirmation added a second message to be forwarded to the military: “Two pilots of this flight observed eight unidentified objects vicinity Langley Field; estimate speed in excess of 1,000 mph; altitude estimated 2,000 feet.” At this point, Captain Koepke came forward and took over control of the DC-4 while Nash and Fortenberry went to work reconstructing the sighting. With a Dalton Mark 7 computer they determined the objects’ angle of approach and the same for the angle of departure. The difference between the two was about 30 degrees; therefore, the objects had made a 150-degree change of course almost instantaneously. They were able to accurately determine their position visually and by reference to their position to the VHF range at Norfolk. The objects first appeared beyond and to the east of Newport News and came toward the DC-4 in a straight line, changed direction beneath the plane and departed in a straight line to the West once again passing a suburban edge of Newport News and seemed to travel out over a dark area before they began to climb steeply into the night sky. They determined that Newport News was 25 miles away and added the additional 10 and 30 miles that they estimated the objects had traveled in each direction, arriving at a total distance of 90 miles. To be conservative they decided to use 50 miles, since they had seen them travel at least that distance. Determining the time duration of the sighting was not so straightforward. Wanting to be accurate, they reenacted the exact sequence of events seven times, and using the panel stopwatch clocks determined that the time period did not exceed 12 seconds each time. Again, to be conservative they adopted 15 seconds in the final computation, which meant that the objects were flying at the rate of 200 miles per minute, or 12,000 miles per hour! They estimated that the objects were slightly more than a mile below the plane, or about 2000 feet above ground level, and by mentally comparing their appearance with the wingspread of a DC-3 at that distance, judged the size to be approximately 100 feet diameter and 15 feet thick. Determinations of distance, size and speed are always open to question by the fact that the objects observed were unidentified phenomena. 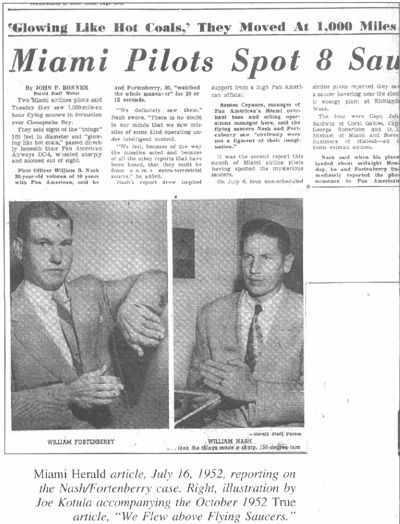 However, this particular incident was especially unique in the sense that the pilots observed the objects between the ground and the plane. Most sightings occur against an empty sky without any standard of comparison to known objects or distance, but in this case the planes altitude of 8000 feet established a finite distance for reference. Nash later qualified his ability to estimate the altitude of the objects in a letter to astrophysicist, Dr. Donald H. Menzel. Further, both Nash and Fortenberry had served in the Navy during the war in which Nash flew patrol bombers for the Naval Air Transport Service patrolling between the African and South American coastlines in search of German submarines. Fortenberry served in the U.S. Navy Air experimental wing for two years and was well aware of aeronautical developments for the time. In naval training, both pilots had received intensive instruction in aircraft identification and had learned to identify every ship in the German Navy. While Nash and Fortenberry were still discussing the matter, the lights of a northbound airliner came into view on a course about 1,000 feet above. Ordinarily the head-on approach of two airliners at 500 mph seems fairly rapid. But in this instance, compared to the streaking speed of the discs, the oncoming plane seemed to be standing still. If any normal happening could have increased the effect of the night’s experience, it was just such a commonplace event. They landed at Miami International Airport shortly after midnight. Upon entering the operations office, they found a copy of the message they had transmitted to the military through Norfolk, with an addition: “Advise crew five jets were in area at the time.” This didn’t exactly apply since the things they had seen were eight in number, and they were dead sure they were not jets. At 7 A.M. Air Force investigators telephoned and an appointment was set for an interview later that morning. USAF Wing Intelligence officer Major John H. Sharpe and four officers from the 7th District Office of Special Investigations met Nash and Fortenberry at the airport. In separate rooms, the pilots were questioned for one hour and forty-five minutes and following that, for a half-hour together. The pilots were duly impressed by the skill and thoroughness of their interrogators. Questions had been prepared in advance and posed individually to the two pilots in order to evaluate their recall. Map overlays were compared and they had a complete weather report for the area, which coincided with the previous night’s flight plan. It stated; 3/8 Cirrus clouds about 20,000 feet. No inversion and a sharply clear night, probably unstable air. Visibility was unusually good. Following the interview, the investigators advised the pilots that they had already received seven additional reports from persons who had witnessed similar incidents within 30 minutes, in the same area. The best was from a Lt. Commander and his wife who described a formation of red discs traveling at high-speed and making immediate directional changes without a turning radius. Being told that their particular experience was by no means unique surprised the pilots. In a letter to the editor of the Norfolk Virginian-Pilot, the naval officer from the cruiser Roanoke, apparently mentioned to Nash and Fortenberry during the OSI investigation, reported that he had sighted eight red lights in the direction of Point Comfort that proceeded in a straight line and then disappeared. He saw the objects at about 8:55 P.M. Eastern Daylight-Saving Time, approximately 15 minutes before the pilot’s sighting, as he was driving towards the Naval base for a 9:00 P.M. appointment. 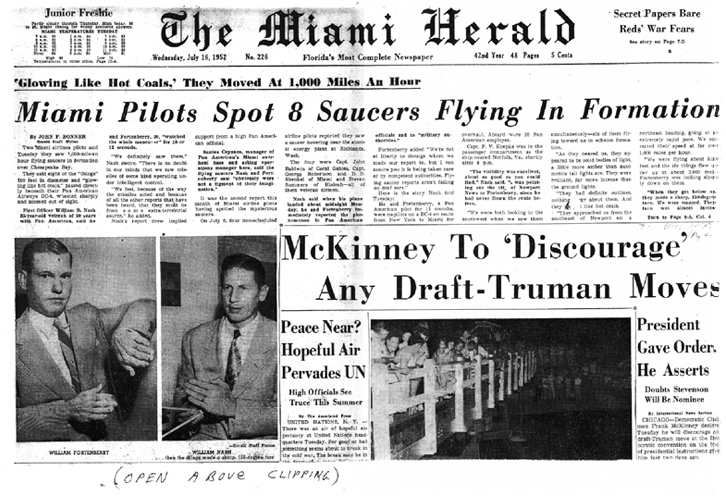 It was not until 1962 that the case would be reexamined by the Director of the Harvard College Observatory, astrophysicist Donald H. Menzel, and published in his book, The World of Flying Saucers: A Scientific Examination of a Major Myth of the Space Age (Doubleday, 1963). At the time, Professor Charles A. Maney, a physicist at Defiance College, had been engaged in a rather lengthy correspondence with Menzel, and when the Nash/Fortenberry sighting came up, Maney forwarded copies of the correspondence to Nash, then an advisor to NICAP. 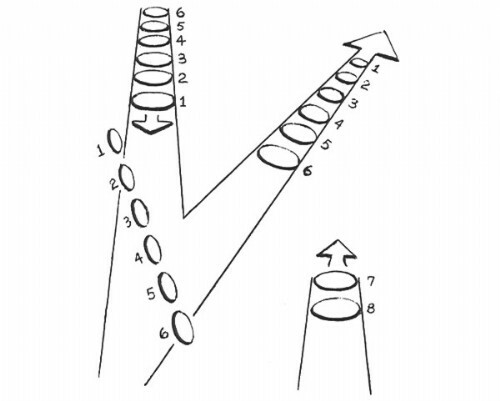 This led to a series of lengthy correspondences over a six-month period between Nash and Menzel providing considerable insight into the process by which Menzel arrived at his eventual solution to the inexplicable sighting. Dr. Menzel’s next line of inquiry concerned whether the reflection could have been caused by an illumination within the cockpit, or possibly a “hostess taking a drag of a cigarette.” Dr. Maney’s rather sardonic response to this possibility was, “Quite a long drag, wouldn’t you say?” But, nevertheless, the pilots weren’t smoking, the cockpit door was closed, there were no hostesses on the flight and the pilot’s observed the object’s reversal out of the right window below the plane. This pretty well convinced Menzel that an internal reflection was unlikely to explain the phenomenon and what Captain Nash had seen was something outside the plane. The soundness of his theory depended on the prevailing weather conditions. Since the official weather reports for that evening indicated that there were no temperature inversions present, Dr. Menzel carefully constructed a scenario in which inversions (albeit in meteorological parlance, a sub refractive condition) could have been present though undetectable by the weather service. In his book, Dr. Menzel asserts that his solution offers, “a highly probable explanation that is consistent with all observations and does not depend on the presence of an extraterrestrial spacecraft.” I have to agree with the later part of the statement, but have no doubt that readers will find further inconsistencies in Dr. Menzel’s impracticable solution. Вечером 14 июля 1952 года самолет Pan American World Airways DC-4 выполнял обычный рейс, переправляясь из Нью-Йорка в Майами с десятью пассажирами и экипажем из трех человек, включая капитана Ф.В. Коепке, первого офицера Уильяма Б. Нэша. и второго офицера Уильяма Х. Фортенберри. Солнце зашло за час до этого, хотя береговая линия была еще видна, а ночь была ясной и почти полностью темной. С установленным на автопилоте самолетом во время полета на высоте 8000 футов над Чесапикским заливом в районе Норфолка (штат Вирджиния), они должны были пролететь над радиостанцией VRF за шесть минут и сделать отчет о местоположении. В то же время, поскольку это был первый запуск Fortenberry по этому курсу, Нэш, находясь в кресле левого пилота, ориентировался на Fortenberry, указывая на ориентиры и отдаленные огни городов вдоль маршрута. «Почти сразу мы почувствовали, что он состоит из шести ярких объектов, летящих к нам с огромной скоростью и, очевидно, значительно ниже нас. У них был огненный вид горячих углей, но они были намного ярче, возможно, в двадцать раз ярче, чем любой рассеянный фонарь, над которым они проходили, или огни города справа. Их форма была четко очерчена и явно круглая. Края были четко очерчены, а красно-оранжевый цвет был равномерным по верхней поверхности каждого корабля ». «В течение нескольких секунд после того, как шесть объектов прошли половину расстояния от того места, где мы их впервые увидели, мы могли заметить, что они держат узкое эшелонное образование, усиленная линия слегка наклонена вправо, с лидером на самой низкой точке, где каждый следующий объект был немного выше. Примерно на полпути, лидер, казалось, попытался внезапно замедлиться. Мы получили это впечатление, потому что второй и третий слегка колебались и, казалось, почти догнали лидера, так что в течение короткого момента в течение оставшейся части их приближения позиции этих трех изменились. Все выглядело так, как будто был введен элемент «человеческой» или «разведывательной» ошибки, поскольку следующие два не отреагировали достаточно быстро, когда лидер начал замедляться». «Все вместе они перевернулись налево и пошли вверх, а светящаяся поверхность была направлена ​​вправо. Хотя нижние поверхности не были четко видны, у нас было впечатление, что они не освещены. Открытые края, также не освещенные, казались толщиной около 15 футов, а верхняя поверхность, по крайней мере, казалась плоской. По форме и пропорциям они были очень похожи на монеты. В то время как все находились в крайнем положении, последние пять скользили над и мимо лидера, так что эшелон был теперь, так сказать, хвостовым, а верхний или последний корабль теперь находился ближе всего к нашей позиции». Эта смена заняла всего короткую секунду и закончилась к тому времени, когда Нэш достиг окна. Затем оба пилота наблюдали, как диски переворачиваются от края к плоскому положению, и вся линия уходит на запад в направлении, которое сформировало острый угол с их первоначальным курсом, удерживая новое образование. Пилоты заметили, что объекты, казалось, немного потускнели непосредственно перед резким угловым поворотом и вернули яркость после этого. Пытаясь описать экстремальные действия объектов, Нэш предложил: «Единственное описательное сравнение, которое мы можем предложить, - это рикошет мяча от стены». «Когда они поднимались, они колебались вверх и вниз друг за другом нерегулярно, как будто они были чрезвычайно чувствительны к контролю. При этом они проходили вертикально друг за другом, подпрыгивая вверх и вниз (точно так же, как передние три проходили горизонтально друг за другом, когда первые шесть приблизились к нам. Это было похоже на интеллектуальную ошибку, «заманивая в строй») - они исчезли, моргнув смешанным образом, без особого порядка ». Их изумленная первоначальная реакция лучше всего подтверждена словами Нэша. «Мы смотрели им вслед, ошеломленные и, вероятно, с открытым ртом. Мы оглянулись на небо, наполовину ожидая, что что-то еще появится, хотя ничего не произошло. Были летающие тарелки, и мы их видели. То, что мы засвидетельствовали, было настолько ошеломляющим и невероятным, что мы могли легко поверить, что, если бы кто-то из нас видел это один, он не решился бы сообщить об этом. Но здесь мы оказались лицом к лицу. Мы не могли ошибиться в таком ярком зрелище». Время было 8:12 по восточному поясному времени. Когда их опыт осенил о них, первым вопросом, который пришёл в голову, было то, видел ли кто-нибудь еще на борту зрелище. Фортенберри прошел через небольшой пассажирский салон, где капитан намеревался оформить документы. В главной каюте тщательный опрос, видел ли кто-нибудь что-нибудь необычное, результатов не дал. «Два пилота этого полета заметили восемь неопознанных объектов вблизи поля Лэнгли; оценить скорость свыше 1000 миль в час; высота оценивалась в 2000 футов». В этот момент капитан Коепке вышел вперед и взял под свой контроль DC-4, в то время как Нэш и Фортенберри приступили к реконструкции наблюдения. С помощью компьютера Dalton Mark 7 они определяли угол сближения объектов и то же самое для угла вылета. Разница между ними была около 30 градусов, поэтому объекты изменили курс на 150 градусов почти мгновенно. Они смогли точно определить свое положение визуально и со ссылкой на свое положение в диапазоне ОВЧ в Норфолке. Объекты впервые появились за пределами и к востоку от Ньюпорт-Ньюс и пришли к DC-4 по прямой линии, изменили направление под самолетом и отошли по прямой линии на запад, еще раз минуя пригородный край Ньюпорт-Ньюс, и, казалось, путешествовать по темной области, прежде чем они начали круто подниматься в ночное небо. Они определили, что «Ньюпорт-Ньюс» находились в 25 милях, и добавили дополнительные 10 и 30 миль, которые, по их оценкам, объекты прошли в каждом направлении, достигнув общего расстояния в 90 миль. Чтобы быть консервативными, они решили использовать 50 миль, так как они видели, как они путешествуют хотя бы на таком расстоянии. Определение продолжительности наблюдения не было таким простым. Желая быть точными, они воспроизвели точную последовательность событий семь раз, и с помощью часовых секундомеров на панели определили, что период времени не превышает 12 секунд каждый раз. Опять же, чтобы быть консервативными, они приняли 15 секунд в окончательном расчете, что означало, что объекты летали со скоростью 200 миль в минуту или 12 000 миль в час! Они подсчитали, что объекты находились чуть более чем в миле ниже плоскости, или примерно на 2000 футов над уровнем земли, и, мысленно сравнивая их внешний вид с размахом крыльев DC-3 на этом расстоянии, оценили размер примерно в 100 футов в диаметре и 15 футов толщиной. Определения расстояния, размера и скорости всегда подвергаются сомнению тем фактом, что наблюдаемые объекты были неопознанными явлениями. Тем не менее, этот конкретный инцидент был особенно уникальным в том смысле, что пилоты наблюдали объекты между землей и самолетом. Большинство наблюдений происходит на пустом небе без какого-либо стандарта сравнения с известными объектами или расстоянием, но в этом случае самолеты на высоте 8000 футов установили конечное расстояние для справки. «Мы оба пролетели много тысяч часов либо на 7000, либо на 8000 футов, потому что эти высоты были достаточно высоки, чтобы избежать большей турбулентности, но не настолько высоки, чтобы наступило кислородное голодание. Следовательно, своего рода «инстинкт-суждение» о высоте объектов постепенно развивалось. Если после 10 000 часов полета на одной и той же высоте пилот не может судить, находится ли что-то (даже что-то незнакомое) на полпути между его самолетом и землей, и разделить это пополам снова, ему лучше всего уйти. Наше суждение после того, как мы увидели, как эти вещи путешествуют почти на сто миль, и наблюдали за ними как на расстоянии, так и почти непосредственно под нами, заключалось в том, что они держали 2000 футов в течение большей части наблюдаемого времени». Кроме того, Нэш и Фортенберри служили на флоте во время войны, в которой Нэш летал на патрульных бомбардировщиках для Военно-воздушной транспортной службы, патрулирующей береговую линию Африки и Южной Америки в поисках немецких подводных лодок. Фортенберри служил в экспериментальном крыле ВМС США в течение двух лет и был хорошо осведомлен об авиационных разработках того времени. В военно-морской подготовке оба пилота получили интенсивную инструкцию в идентификации самолета и научились идентифицировать каждый корабль во флоте Германии.